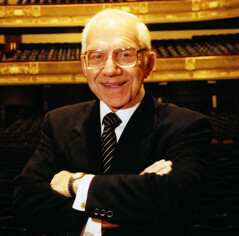 Leo Beranek was born in Solon, Iowa, September 15, 1914. He received his B. A. degree from Cornell College (Iowa) in 1936 and his Doctorate from Harvard University in 1940. He remained on the faculty at Harvard until 1947 and then became Associate Professor of Communication Engineering at the Massachusetts Institute of Technology. In 1948 He joined with two other professors at MIT to form Bolt Beranek and Newman, an acoustics and computer consulting firm. As President, he put together one of the finest computer software groups in the East, and in 1968 BBN received the government contract to build the ARPANET. That contract called for inventing a network to connect together 19 main-frame computers in universities and government laboratories. The network was successful. The firm invented e-mail (with the sign @) in 1970. When the network grew large enough, the government ceased supporting it and it became known as the INTERNET. In 1963 a group of thirty Massachusetts citizens who were interested in bringing better television to Boston was formed, called Boston Broadcasters, Inc. (BBI). Beranek was named President. The Federal Communications Commission had opened up Channel 5 in Boston for competitive competition because the owners, the Boston Herald Traveler Corporation (then operating the station as WHDH), had engaged in ex- parte contacts with the FCC Chairman before it went on the air. After a year of hearings, a “hearing examiner” decided in 1965 that the license should stay with WHDH because BBI had made promises that were “excessive and unlikely to be executed.” But the FCC reversed this decision and awarded the right to broadcast to BBI. After years of litigation in the Federal Court system, instituted by WHDH, the Supreme Court of the United States ruled in favor of BBI. The station went on the air in March 1972 with the call letters WCVB- TV-5, Boston. In 1976 the Radio and Television Commission of the Southern Baptist Association gave Beranek their Abe Lincoln Award for “superior community service programs and courageous editorials.” In 1981, under the headline, “Some say this is America’s best TV station,” The New York Times ran a full-page article focused on WCVB’s innovative local programming. On May 17, 1982, Boston Broadcasters Inc. sold WCVB-TV to Metromedia. Thus ended Beranek’s career as a television executive. He then returned to his life-long interest in concert hall design. Lenox, MA. In 2003 Beranek received the National Medal of Science, America’s highest science award, which was conferred on him by President George W. Bush in the White House.